If you watch television, particularly home improvement shows, you’ve probably heard of the Kitchen Triangle. 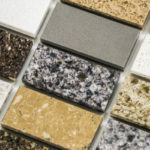 But, even if you’ve heard the term, do you know what it is, where it came from, or why it is important in your kitchen remodeling plan? Today, we’ll explore the kitchen triangle, its significance to your kitchen’s style and function, and how to remodel with it in mind. The kitchen triangle also known as the kitchen work triangle consists of the cook (stove) top, sink, and refrigerator. 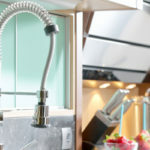 The invisible lines which connect these three all important kitchen stations form the kitchen triangle. The premise is based on the notion that when these kitchen essentials are arranged properly, the optimum work space is created, delivering ease and functionality to the kitchen. Kitchen triangle legs should range from four to nine feet. The perimeter of the kitchen triangle should be 12 to 26 feet. There should be no obstacles intersecting the kitchen triangle legs. Because the kitchen is a busy place – where children play, where meals are prepared, where snacks are served – it is often considered the hub of the home. And as such, it needs to run smoothly and function efficiently. So, remodeling with the kitchen triangle in mind is must – from the cleaning space (sink/dishwasher) to the cooking space (stove/oven/cooktop) to the storage space (refrigerator/freezer). The L-shaped kitchen delivers the optimal opportunity for a fully efficient kitchen triangle because the adjacent walls create a natural triangle. In addition, an L-shaped design offer increased flexibility and allows for the addition of an island. 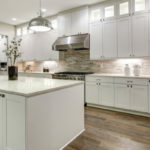 With an island, you can minimize the work triangle if you choose to place your sink or cooktop on the island in close proximity the other kitchen triangle elements. If an L-shaped kitchen is not an option, a galley kitchen layout also supports the utilization of the kitchen triangle. In a galley kitchen, the dimensions of the kitchen triangle are limited, and each triangle leg should measure in the range of four to six feet. With a galley kitchen, the kitchen triangle is often a right triangle. Innovative open-concept kitchens often challenge the uniformity of the classic kitchen triangle as work areas sprawl into living areas. The kitchen triangle concept can remain intact in these kitchens as long as flow is maintained from cleaning to cooking to storage areas, though it may not adhere to the traditional measurements of the triangle. 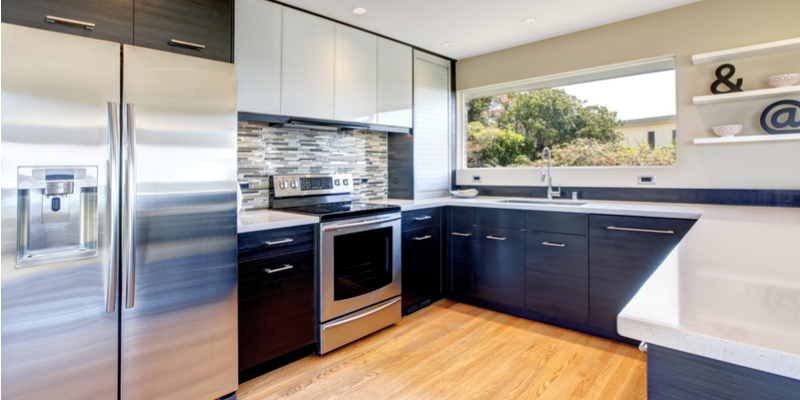 Designers who adhere to the principles of feng shui, also may take issue with the traditional kitchen triangle. When designing with feng shui while maintaining the kitchen triangle, one must ensure the cook’s back is not vulnerable to the door of the kitchen so as to retain the harmony of the practice. 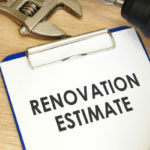 By following the recommendations above when remodeling your kitchen, you should find when the project is complete that your kitchen functions efficiently and allows for optimal enjoyment by family, friends, and guests.